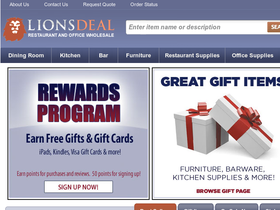 Save $15 on orders over $250 from Lions Deal when you use this coupon code at checkout. Click link to get started. When purchasing over $195 or more from LionsDeal.com receive Free Shipping on select items. Use this exclusive 58Coupons.com coupon code and save 5% on any order from Lionsdeal. Purchase $95 and receive $5 off your order at Lionsdeal.com Click to view code. Lionsdeal.com is discounting items up to 50% throughout their store while supplies last. Click on the link to view sale items.